FIXYOURTHINKING.COM / Need a brain? Borrow mine! : The TappleT ??? The new name for the Twittering Tablet thingy that I discussed last week and has been rumored about for years? The TappleT ??? The new name for the Twittering Tablet thingy that I discussed last week and has been rumored about for years? I am pretty sure the tablet will be called t t = tapplet. 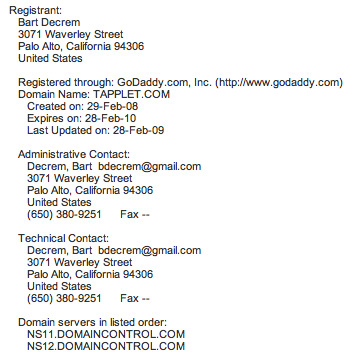 So, I decided to look up the domain to see if I could register it. I like the name even if Apple doesn't release a tablet thingy. I don't know if this information is consistent with any of the other "domain registrations" Apple has done privately ... but even if it isn't I'm sure the domain could be easily bought. Wouldn't the name "TappleT" which sounds like "Tablet" and with an Apple logo in the center where it could stand for "APPLE" or [wee] (completing the word TweeT) be an awesome name for such a device. Apple needs to have more devices like the "AppleTV" that actually have the name "Apple" in them for branding instead of continuing to coin name after name that at least mindshare-wise has no association with Apple. A lot of my customers in my day to day Apple tech business call Apple ... Mac. Customer: "Who makes that? Mac?" He currently works for TAPULOUS ... a large iPhone app developer.